While it will never garner the attention of Texas, Florida or California, the state of Kansas is receiving its fair share of the college football recruiting spotlight. A year after Olathe South’s Braden Smith (Auburn) and Hiawatha’s Peyton Newell (Nebraska) received an elaborate amount of NCAA Division I scholarship offers, a large number of Kansas athletes verbally committed with D-I schools before their senior prep seasons even started. Harris, a 6-foot-3, 297-pound offensive lineman, verbally committed to the Missouri Tigers in April. He is considered the No. 1 recruit in Kansas by Rivals.com and ESPN Recruiting Nation. Both organizations consider Harris a four-star recruit. Rivals.com touts him as the No. 19 offensive guard prospect in the country. ESPN gives Harris a scout grade of 80 and considers him the nation’s 272nd-best high school recruit overall and No. 22 at his position. Delton, a 6-0, 187-pound quarterback, committed to Kansas State in February. The Hays speedster is listed as the No. 4 recruit in the state by Rivals and No. 6 by ESPN. He entered his senior season with nearly 2,000 yards passing and more than 1,300 yards rushing in his career. Rivals considers Delton the No. 16 dual-threat quarterback in the nation. The 6-5, 250-pound tight end verbally committed with the Ohio State Buckeyes in July. Moore is listed as the No. 3 recruit in the state by ESPN and No. 5 by Rivals.com. He offers the combination of size and athleticism that Division I colleges are looking for in a tight end. ESPN rates Moore as the No. 13 tight end in the nation. Willis, a 6-4, 200-pound quarterback, verbally committed with the Kansas Jayhawks in May. He follows in the footsteps of Bishop Miege graduate Montel Cozart, who is now the quarterback at KU. Rivals touts Willis as the No. 3 recruit in Kansas and the No. 20 pro-style quarterback in the nation. Willis passed for 284 yards and four touchdowns in last week’s win over Class 6A’s Blue Valley. Applegate, a 6-6, 270-pound offensive lineman, verbally committed to the Kansas State Wildcats in August. ESPN and Rivals both rank him as the No. 7 recruit in Kansas. The 6-5, 285-pound lineman verbally committed with K-State in June. He is rated as the No. 5 recruit in Kansas by ESPN and at No. 6 by Rivals. Rivals also considers Frantz to be the No. 66 offensive tackle recruit in the nation. Gaylord, a 6-7, 285-pound offensive lineman, committed to his childhood favorite Nebraska Cornhuskers in February. He is considered the No. 2 recruit in the state by Rivals and the No. 4 recruit by ESPN. Rivals lists him as the No. 41 offensive tackle in the country. 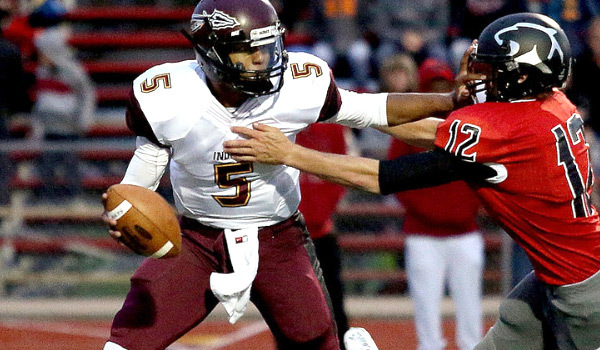 Peterson, a 6-3, 195-pound pro-style quarterback, verbally committed with Texas State in June. The three-sport standout passed for 775 yards while rushing for 476 yards as a junior. Texas State is coached by Kansas native Dennis Franchione. ESPN ranks Peterson as the No. 15 recruit in Kansas. The 5-11, 190-pound running back verbally committed with the Wildcats in June as an athletic prospect. ESPN considers him the No. 9 recruit in the state. He has been clocked at less than 4.5 seconds in the 40-yard dash. Goolsby could play a variety of positions at K-State. Spears, a 6-2, 205-pound linebacker, verbally committed with the Cyclones in July. Spears recorded 122 tackles and 11 tackles for loss as a junior for Olathe North. He is ranked as the No. 10 recruit in the state by Rivals and No. 11 by ESPN. Other top recruits in Kansas who have yet to commit with a team include Pittsburg running back and defensive back Alex Barnes, Wichita Trinity running back Tyler Burns, Derby defensive back Darreon Jackson and Kansas City Piper linebacker Colton Beebe.